Navin Prabhakar .. the name itself gets a smile on our face with the expression Paichankon !!! 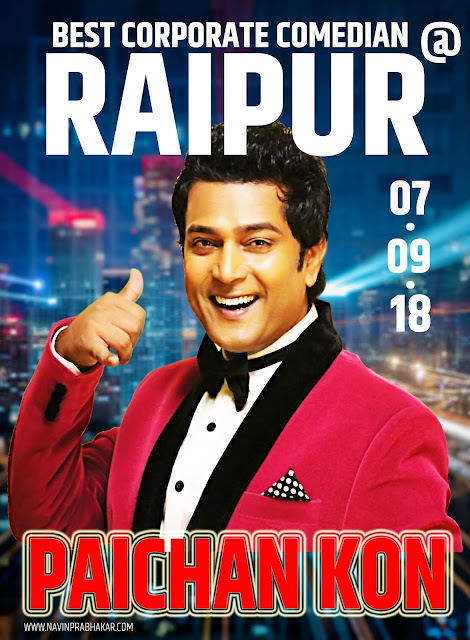 He shot to fame with his stint in The Great Indian Laughter Challenge-2005 and since then he is ruling our hearts with amusing Satnd-up Comedy, Mimicry, Dubbing All Bollywood actors Voice-Over for them, Anchoring, and Acting & Singing. 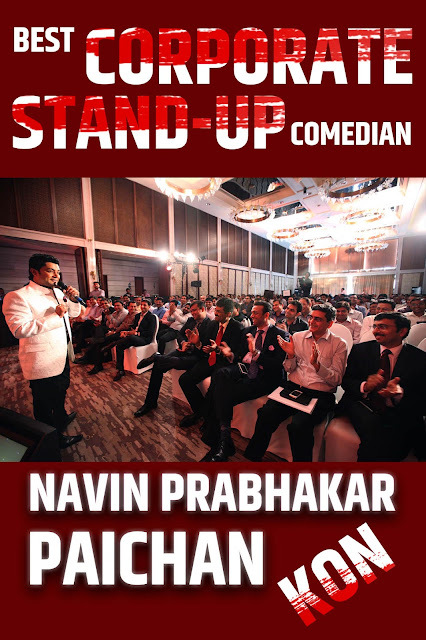 Navin Prabhakar is the pioneer in Corporate Stand-up Comedy with more than 3000+ shows in his kitty within a span of 14years. He is known to sketch shows according to the audience. He performs regularly at all corporate event, comedy clubs and private shows in India & abroad. His exemplary mimicking skills make him the most sought after Mimicry Artist in India. He can Mimic about 120 voices like shahrukh Khan, Amrish Puri, Salman Khan, Akshay kumar, Sanjay Dutt, Ajay Devegan, Sunny Deol, Sunil Shetty, Amrish Puri, Feroz Khan Vinod Khanna, jeetendra, Govinda, Nawazuddin, etc.. He also works as Voice Over artist and lends his voice to many films, ads, corporate films & documentaries. 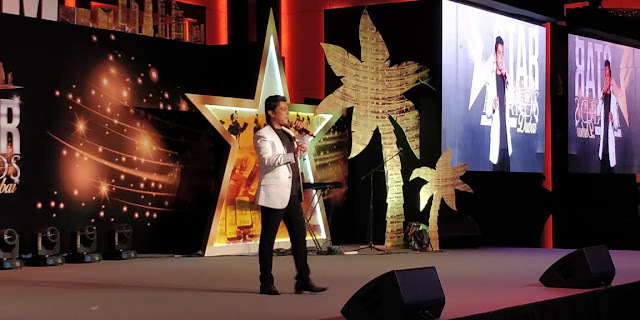 He is known for his Anchoring ability hence hosted Videocon Screen Awards Night for two consecutive years (2013 &2014). Adding to this he also hosted Some Bollywood Awards Nights For The Corporates. 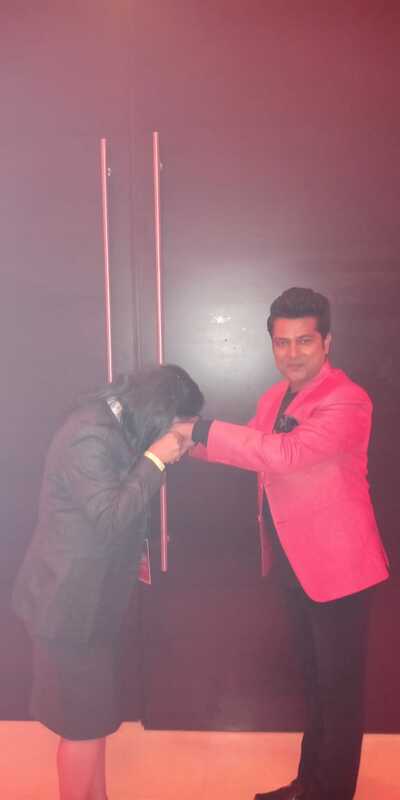 Navin successfully did 9 world tours till now along with big Bollywood stars as paly back singer and comedian. Subsequently, he hosted many Bollywood nights, corporate nights & many other events. Though Navin appeared in cameo roles in many films but later he debut as lead in the Marathi films in the year 2013. Navin as we know is multi-talented is now trying his hand in Direction. He already directed few short films and ads films. 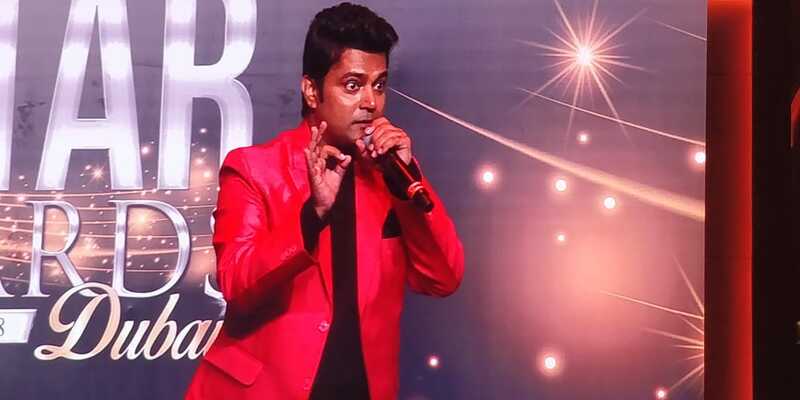 Over the years Navin has performed in several shows and hosted numerous hit shows till date. .....some ppl creats memories in Our lives and makes the moment, the day, the week, the year and the years so memrable for life time.
" I know I m disterbing this live performance.. I will just take a moment to share the thing jo baat mere dill mei hai.. mai jaanti hu ki abhi nahi toh kabhi nahi .. well i m a diehard fan Of Mr Navin Prabhakar when we watch his paochankon i and my entire family allways admired him his sence of humour his style of making the character live.. hum ghar me baith kar mom dad Bhai behen cousins ke saath inka har episode dekte thhe .. fir kuchh dino ke baad mere ghar wale hum thode se bade hone ke baad apne apne kaam me bizy ho gaye... unfortunatly aaj kuch iss duniya mai nahi hai .. lekin aaj jab bhi hamare family ki khushyo ko hum yaad karte hain toh paichankon hi dimaag mei baitha hua hai .. hum saare sirf Navin ji ke liye tv ke saamne unke aane ka wait karte thhe aaj I m so fortunate that I could enjoy him so live infront of me .. Navin Sir Can i have ur hands please ? And she did this on stage infornt of all the 1500 audience !! ( the 1st pic down ) "Mrs kahndelwal" ddnt carry the camera phone on stage that time but again she approached me at backstage after the gig with her office colleagues and freinds. She clicked the moment and shared the supper happiness with me..
Freinds i think this is how God is around with you bass nazariya hona chahiye unke blessings lene ka .. 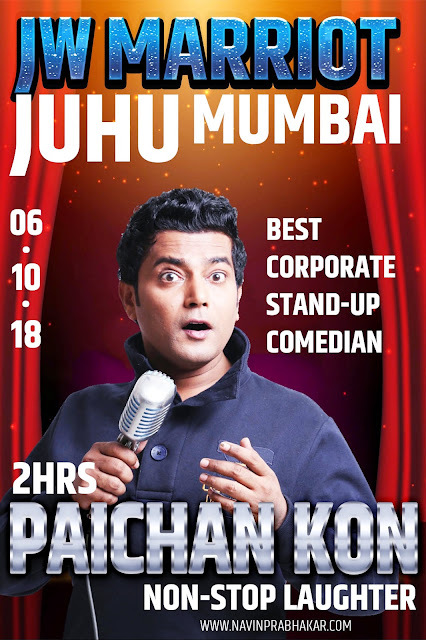 I personaly thanks to my all fans and friends families on FB pls keep meeting these Gods n Goddess aorund you ..
Those, who are looking to be a Well-Known Corporate Stand-up Comedian, should keep in mind that to win the audience is not that easy. This is true and you must have noticed it while performing in front of them. These days, everyone has his own life and very own worries. People probably come to pay and see some stand-up comedy acts to refresh them. If you are not providing them the expected results then you are in deep trouble. You may not be called again for some act and your dream of becoming a Famous Stand-up Comedian will be doomed. Of course, you do not want any such thing in your career. This is why, you should be known with the jokes you are delivering and especially the approach with which you are delivering them. You can always take some help from the Old Stand-up Comedians videos or from the videos of the new Successful Comedians. You should focus on the way they deliver their content, their timings, and their body language. A Successful Stand-Up Comedian is the one, who stays natural and delivers some great jokes that make audience go crazy. You need to have the natural humorous style to be A Great Corporate Stand-UpComedian. If it is your start then you can practice your acts by performing in the small gatherings including the schools, colleges, or small hotels. They may pay you less but it will be good for your practice. You will also get to know that what sort of jokes you can say in front of the kids, youngsters, and adults. Even a Natural Comedian needs some polishing to appear as the exploding comedian. 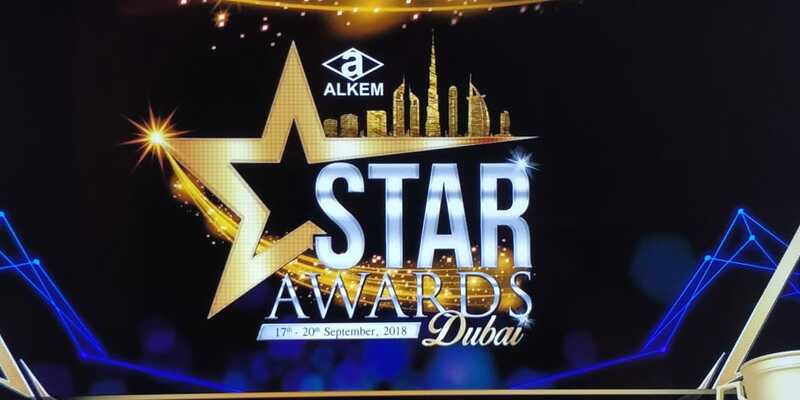 Hence, if you are looking to learn some good tactics regarding the Stand-up Comedy then you can either take help from the stand-up comedy videos or join some reputable school, which can teach you about the basics of this type of comedy. A High-Quality Stand-Up Comedy revolves around our daily life and the things around us. No one likes to hear the hammering comedy or some rocket science kind of jokes. A simple joke with the powerful punch line and the wicked expressions can give laughing fits to your audience. Remember that, funny expressions are what that attract the audience most. So, if you are keen to make some career as a comedian then keep these essentials in mind and start practicing it from today. ( said by Mr Navin Prabhakar )..
" I know I m disterbing this live perofmenac will just take a moment to share the thing jo baat mere dill mei hai.. mai jaanti hu ki abhi nahi toh kabhi nahi .. well i m a diehard fan Of Mr Navin Prabhakar when we watch his paochankon i and my entire family allways admired him his sence of humour his style of making the character live.. hum ghar me baith kar mom dad Bhai behen cousins ke saath inka har episode dekte thhe .. fir kuchh dino ke baad mere ghar wale hum thode se bade hone ke baad apne apne kaam me bizy ho gaye... unfortunatly aaj kuch iss duniya mai nahi hai .. lekin aaj jab bhi hamare family ki khushyo ko hum yaad karte hain toh paichankon hi dimaag mei baitha hua hai .. hum saare sirf Navin ji ke liye tv ke saamne unke aane ka wait karte thhe aaj I m so fortunate that I could enjoy him so live infront of me .. Navin Sir Can i have ur hands please ? And she did this on stage infornt of all the 1500 audience !! ( the 1st pic down ) "Mrs kahndelwal" ddnt carry the camera phone on stage that time but again she approached me at backstage after the gig with her office colleagues and freinds.